Wherever life takes you, experience your music with amazingly powerful stereo sound and crisp, tight bass. Boasting less than 1% total harmonic distortion, iPop sounds fabulouseven at the highest volumes. Built in 4400mah battery, iPop playtimeup 10 hours. Enjoy the music all the time. Smaill size, lightweight, easy to carry around with a carry string. Take the music with you wherever you go. Unlike most other speakers, iPop uses the very latest Bluetooth technology to maximize device compatibility and pairing speed. 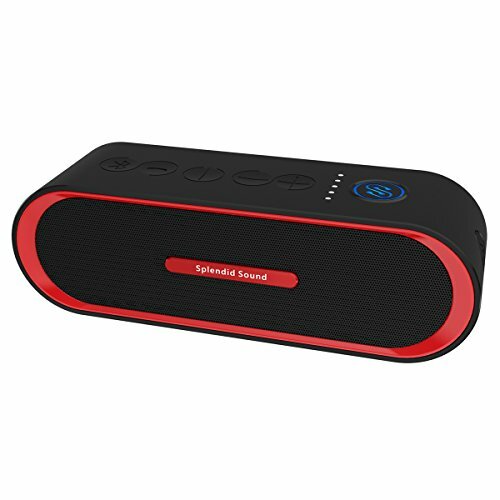 【WIRELESS PORTABLE BLUETOOTH SPEAKER】: Enjoy the High Definition stereo sound with an impressive volume whether you're partying, jogging, camping, hiking, biking or lounging around the house. 【OUTSTANDING SOUND】: Dual 8W professional speakers with a patent pending diaphragm designcreates amazing sound within an incredibly compact enclosure. 【LONG PLAYTIME】: Built-in Li-Ion 4400 mAh rechargeable battery guarantees up to 10 hours of playtime. Full recharged in just 3.5 hours with included micro USB cable. 【IPX66 LEVEL WATER RESISTANT】: Splashproof, which means water splashing against the enclosure from any direction shall have no harmful effect. iPop is terrific for outdoors, perfect for the beach, poolside, car, boat and golf cart. But note iPop cannot be partially or fully submerged into water. 【WHAT YOU GET】: Splendid Sound iPop Bluetooth Speaker, micro USB charging cable, Aux in cable, user guide, our worry-free 12-month warranty and friendly customer service, which make your purchase absolutely risk-free and you can enjoy testing out it's quality and durability. If you have any questions about this product by Iotton, contact us by completing and submitting the form below. If you are looking for a specif part number, please include it with your message.